The Seville, FL area has had 0 reports of on-the-ground hail by trained spotters, and has been under severe weather warnings 10 times during the past 12 months. 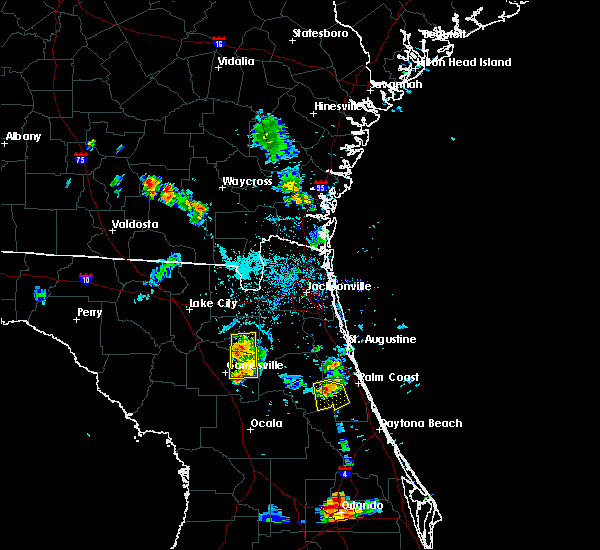 Doppler radar has detected hail at or near Seville, FL on 35 occasions, including 4 occasions during the past year. 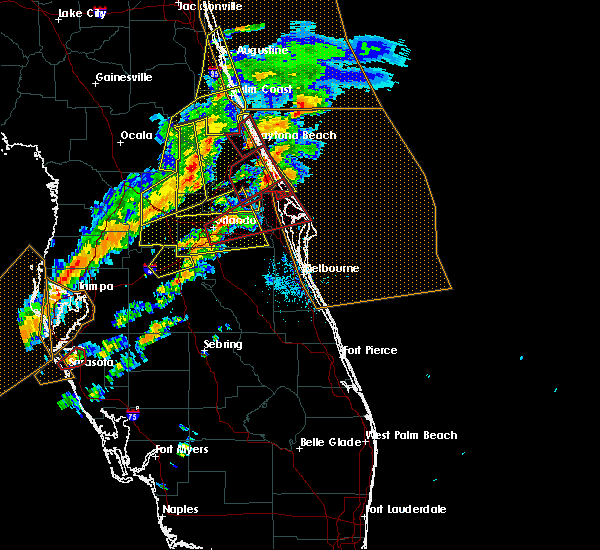 4/19/2019 1:51 PM EDT At 149 pm edt, severe thunderstorms were located along a line extending from lake george to eustis to near mascotte, moving northeast at 60 mph (radar indicated). Hazards include 60 mph wind gusts. Expect damage to roofs, siding, and trees. Locations impacted include, apopka, ocoee, winter garden, leesburg and eustis. 7/22/2018 1:56 PM EDT The severe thunderstorm warning for northwestern volusia county will expire at 200 pm edt, the storm which prompted the warning has weakened below severe limits, and has exited the warned area. therefore, the warning will be allowed to expire. 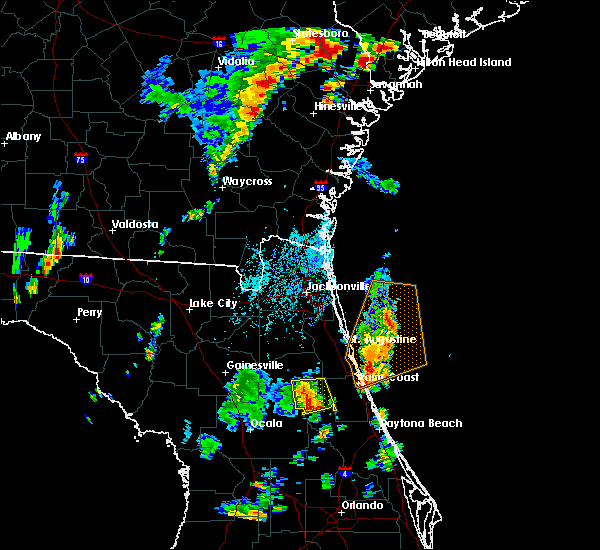 a severe thunderstorm watch remains in effect until 800 pm edt for east central florida. to report severe weather, contact your nearest law enforcement agency. they will relay your report to the national weather service melbourne. 7/22/2018 1:40 PM EDT At 138 pm edt, a line of severe thunderstorms is located from lake george to ormond-by-the-sea, and is nearly stationary (radar indicated). Hazards include 60 mph wind gusts and quarter size hail. Hail damage to vehicles is expected. expect wind damage to roofs, siding, and trees. Locations impacted include, daytona beach, ormond beach, south daytona, holly hill and pierson. 7/22/2018 1:18 PM EDT The national weather service in melbourne has issued a * severe thunderstorm warning for. 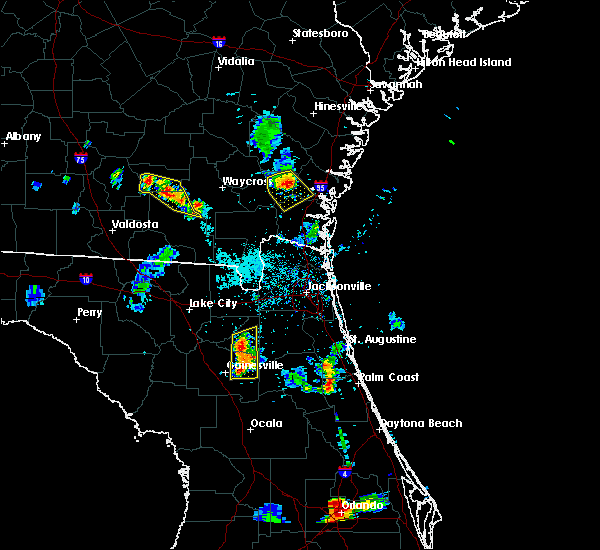 northwestern volusia county in east central florida. until 200 pm edt. At 118 pm edt, a severe thunderstorm was located near ormond-by-the-sea, moving east at 35 mph. 7/22/2018 1:09 PM EDT At 109 pm edt, severe thunderstorms were located along a line extending from near palm coast to 7 miles southeast of crescent city, moving east at 50 mph (radar indicated). Hazards include 70 mph wind gusts and quarter size hail. Hail damage to vehicles is expected. expect considerable tree damage. wind damage is also likely to mobile homes, roofs, and outbuildings. Locations impacted include, palm coast, bunnell, crescent city, andalusia, beverly beach and espanola. 7/22/2018 1:03 PM EDT At 102 pm edt, a severe thunderstorm was located 7 miles north of pierson, or over bakerstown, moving east at 15 mph (radar indicated). Hazards include 60 mph wind gusts and quarter size hail. Hail damage to vehicles is expected. Expect wind damage to roofs, siding, and trees. 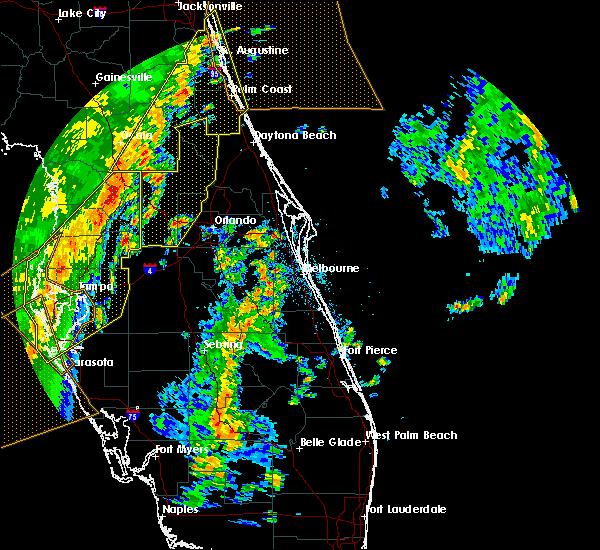 7/22/2018 1:03 PM EDT At 103 pm edt, severe thunderstorms were located along a line extending from palm coast to 9 miles northeast of pierson, moving southeast at 35 mph (radar indicated). Hazards include 60 mph wind gusts and quarter size hail. Hail damage to vehicles is expected. expect wind damage to roofs, siding, and trees. Locations impacted include, palm coast, flagler beach, bunnell, crescent city, andalusia, marineland, beverly beach and espanola. 7/22/2018 12:48 PM EDT At 1247 pm edt, severe thunderstorms were located along a line extending from near butler beach to near fruitland, moving east at 50 mph (radar indicated). Hazards include 60 mph wind gusts and quarter size hail. Hail damage to vehicles is expected. Expect wind damage to roofs, siding, and trees. 4/15/2018 2:59 PM EDT At 259 pm edt, severe thunderstorms were located along a line extending from near lake geneva to interlachen to emeralda, moving northeast at 35 mph (radar indicated). Hazards include 70 mph wind gusts. Expect considerable tree damage. damage is likely to mobile homes, roofs, and outbuildings. locations impacted include, palatka, crescent city, interlachen, pomona park, east palatka, salt springs, juniper springs, lake delancy, florahome and melrose landing. 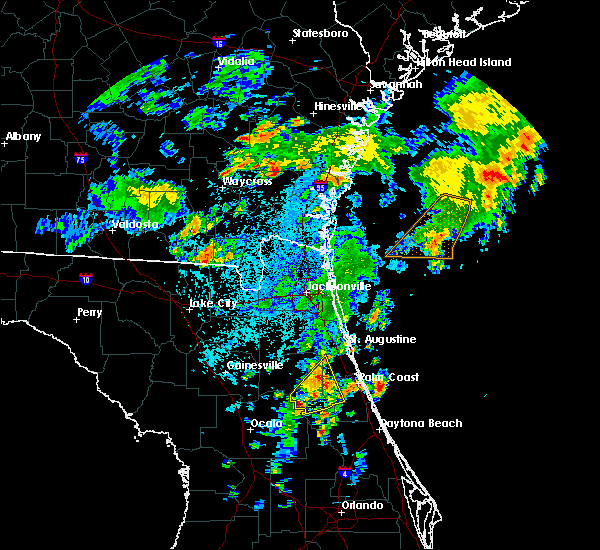 A tornado watch remains in effect until 600 pm edt for northern and northeastern florida. 9/10/2017 5:45 PM EDT At 544 pm edt, a severe thunderstorm capable of producing a tornado was located over deleon springs, moving west at 40 mph (radar indicated rotation). Hazards include tornado. Flying debris will be dangerous to those caught without shelter. mobile homes will be damaged or destroyed. damage to roofs, windows, and vehicles will occur. Tree damage is likely. 9/1/2017 4:11 PM EDT At 411 pm edt, a severe thunderstorm was located near fruitland, or near salt springs, moving northeast at 15 mph (radar indicated). Hazards include 60 mph wind gusts and quarter size hail. Hail damage to vehicles is expected. Expect wind damage to roofs, siding, and trees. 1/22/2017 7:53 PM EST At 752 pm est, a line of severe thunderstorms was located from pierson to eustis, moving northeast at 65 mph (radar indicated). Hazards include 60 mph wind gusts and quarter size hail. Hail damage to vehicles is expected. Expect wind damage to roofs, siding, and trees. 1/22/2017 7:52 PM EST At 750 pm est, severe thunderstorms were located along a line extending from near barberville to near paisley to near mascotte, moving east at 60 mph. the threat for damaging winds is especially high near paisley and cassia (radar indicated). Hazards include 70 mph wind gusts and quarter size hail. Hail damage to vehicles is expected. expect considerable tree damage. wind damage is also likely to mobile homes, roofs, and outbuildings. locations impacted include, apopka, leesburg, eustis, tavares and mount dora. 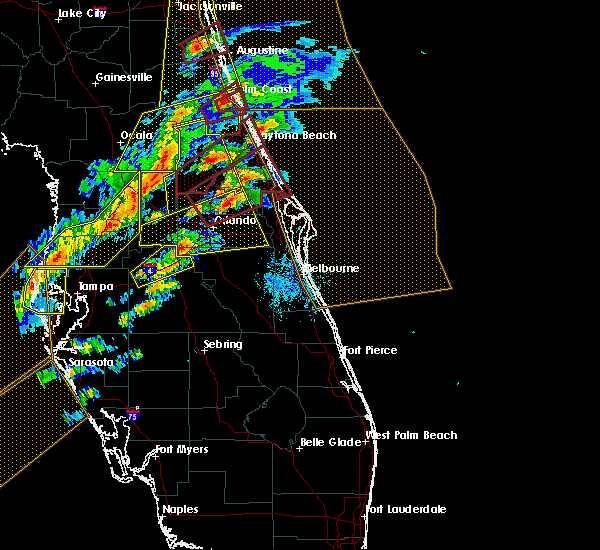 A tornado watch remains in effect until 1000 pm est for east central florida. 1/22/2017 7:26 PM EST At 726 pm est, severe thunderstorms were located near lisbon and leesburg, moving northeast at 55 mph (radar indicated). Hazards include 70 mph wind gusts. Expect considerable tree damage. Damage is likely to mobile homes, roofs, and outbuildings. 1/22/2017 6:56 PM EST At 656 pm est, a severe thunderstorm capable of producing a tornado was located near lake george, or near salt springs, moving northeast at 55 mph (radar indicated rotation). Hazards include tornado and quarter size hail. Flying debris will be dangerous to those caught without shelter. mobile homes will be damaged or destroyed. damage to roofs, windows, and vehicles will occur. Tree damage is likely. 1/22/2017 6:55 PM EST At 654 pm est, a severe thunderstorm capable of producing a tornado was located near lake george, or near salt springs, moving northeast at 60 mph (radar indicated rotation). Hazards include tornado and quarter size hail. Flying debris will be dangerous to those caught without shelter. mobile homes will be damaged or destroyed. damage to roofs, windows, and vehicles will occur. tree damage is likely. This tornadic thunderstorm will remain over mainly rural areas of northwestern volusia county, including the following locations: bakerstown. 1/22/2017 6:53 PM EST At 653 pm est, a severe thunderstorm capable of producing a tornado was located over salt springs, moving northeast at 45 mph (radar indicated rotation). Hazards include tornado and quarter size hail. Flying debris will be dangerous to those caught without shelter. mobile homes will be damaged or destroyed. damage to roofs, windows, and vehicles will occur. tree damage is likely. Locations impacted include, crescent city, pomona park, salt springs, fruitland, georgetown and lake como. 1/22/2017 6:49 PM EST At 649 pm est, a severe thunderstorm capable of producing a tornado was located near salt springs, moving northeast at 45 mph (radar indicated rotation). Hazards include tornado and quarter size hail. Flying debris will be dangerous to those caught without shelter. mobile homes will be damaged or destroyed. damage to roofs, windows, and vehicles will occur. tree damage is likely. Locations impacted include, crescent city, pomona park, salt springs, fruitland, welaka, lake como and georgetown. 1/22/2017 6:40 PM EST At 640 pm est, severe thunderstorms were located along a line extending from near anthony to 6 miles southwest of inverness highlands south, moving northeast at 75 mph (radar indicated). Hazards include 60 mph wind gusts and quarter size hail. Hail damage to vehicles is expected. Expect wind damage to roofs, siding, and trees. 1/22/2017 6:39 PM EST At 637 pm est, severe thunderstorms were located near cassia, mount dora, and mount plymouth, moving northeast at 40 to 50 mph (radar indicated). Hazards include 70 mph wind gusts and quarter size hail. Hail damage to vehicles is expected. expect considerable tree damage. Wind damage is also likely to mobile homes, roofs, and outbuildings. 1/22/2017 6:38 PM EST At 637 pm est, a severe thunderstorm capable of producing a tornado was located over lynne, moving northeast at 45 mph (radar indicated rotation). Hazards include tornado and quarter size hail. Flying debris will be dangerous to those caught without shelter. mobile homes will be damaged or destroyed. damage to roofs, windows, and vehicles will occur. Tree damage is likely. 5/31/2016 7:52 PM EDT At 752 pm edt, a severe thunderstorm was located over andalusia, moving south at 10 mph (radar indicated). Hazards include 60 mph wind gusts and penny size hail. Expect damage to roofs. siding. and trees. Locations impacted include, crescent city, pomona park, andalusia and lake como. 5/31/2016 7:29 PM EDT At 729 pm edt, a severe thunderstorm was located near andalusia, moving south at 10 mph (radar indicated). Hazards include 60 mph wind gusts and penny size hail. Expect damage to roofs. siding. And trees. 8/23/2015 7:53 PM EDT At 752 pm edt, doppler radar indicated a severe thunderstorm capable of producing damaging winds in excess of 60 mph. this storm was located near lake george, and moving southeast at 10 to 15 mph. 7/12/2015 4:26 PM EDT The severe thunderstorm warning for northeastern lake and northwestern volusia counties will expire at 430 pm edt, the storms which prompted the warning have weakened below severe limits, and no longer pose an immediate threat to life or property. therefore the warning will be allowed to expire. however, gusty winds, frequent lightning, and heavy rain will continue with these thunderstorms as they drift south at 15 mph. 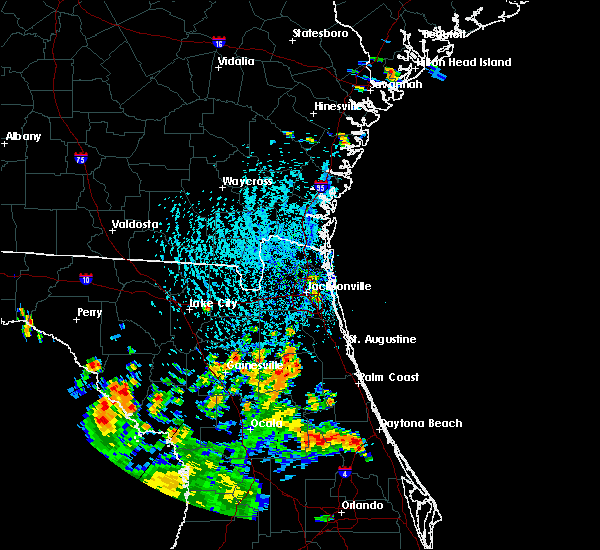 7/12/2015 4:00 PM EDT At 358 pm edt, doppler radar indicated a cluster of thunderstorms capable of producing damaging winds in excess of 60 mph. these storms extended from lake george to lake woodruff and were moving southwest at 15 mph. penny size hail may also accompany the damaging winds. locations impacted include, pierson, barberville, deleon springs, lake george and astor park. 7/12/2015 3:43 PM EDT At 343 pm edt, doppler radar indicated a severe thunderstorm capable of producing damaging winds in excess of 60 mph. this storm was located over pierson, and moving southwest at 30 mph. penny size hail may also accompany the damaging winds. 6/12/2015 4:54 PM EDT At 454 pm edt, doppler radar indicated a severe thunderstorm capable of producing damaging winds in excess of 60 mph. this storm was located over fruitland, or near salt springs, and moving north at 15 mph. penny size hail may also accompany the damaging winds.